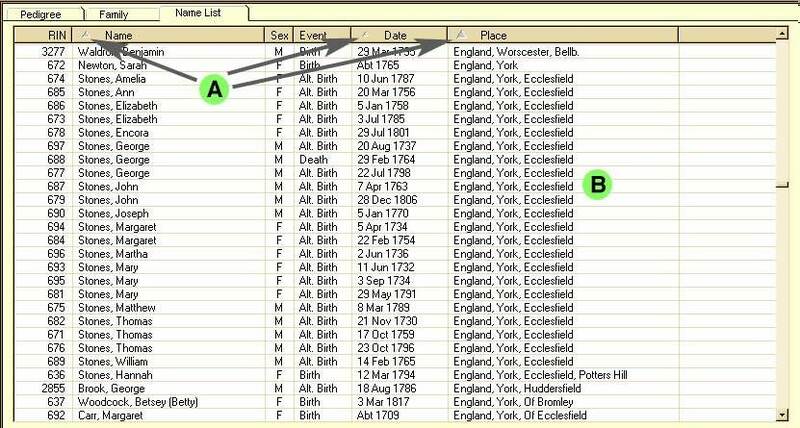 Ancestral Quest features many ways to get to the data that you want to see in your file. In this option, you see a view of the current person, his/her siblings, parents, spouses and children. By clicking on a person, it re-focuses the screen using that person as the main person. Most of the time, you are searching for a close relative of the current person. This screen makes it a snap to quickly select another person who is closely related. View all the individuals in your file. Search for individuals by name or record number (RIN). If you notice a problem with your data, you can edit or delete individuals from the list. Notice the button in the upper right corner -- you see how each individual is related to you as you scroll through the list. If you push the button, you'll see a screen giving full lines of descent from the common ancestor to each you and the highlighted person. The Advanced button in the lower right corner opens an advanced searching area of the screen. See below. Select groups of people for reports, for exporting to GEDCOM, or for splitting your database. Or, narrow the list to help you find someone more easily. Highlight individuals based on their relationships. For example, select all those related to the ancestors of a person. Or select couples, families or descendants. There are dozens of options. 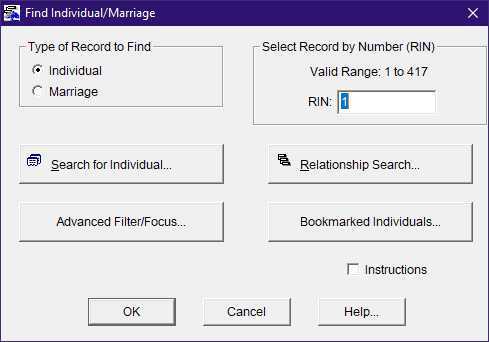 Or highlight individuals based on the data in their records, such as a date range, location, number of children or marriages. See Searching Your Database, below for more. Use either type of list by itself, or combine the lists. Keep your criteria simple or make them as complex as you want. Select from any field. Each field has its own set of special criteria. There are even special cases such as “deceased”, which looks at more than just the death date. For LDS, there are criteria for temple qualification. Some name fields allow for “Sounds Like”. You can do simple queries, like “Born in Germany between 1820 and 1860”, or use the boolean logic AND, OR and parenthesis to make queries as complex as you want. Once a complex query is defined, you can save it to re-use later.